In order to know a little bit about Dr. Chris, one has to take a trip – off the island – to the mainland. Dive deep into the interior of the continent, all the way to the prairie heartland, on the banks of a body of water that bears little resemblance to our crystalline, blue Pacific; the muddy Mississippi River – home of giant carp, riverboats, and irritable catfish. It was there, in Moline, Illinois, that Chris grew up with three brothers, a sister, and loving parents. His father, Dr. Donald J McNeil, was a dentist in this river town community, with a practice that spanned 50 years and numbered legions of devoted patients. It was at his father’s knee that Chris got his first exposure to life at The Office; helping prepare fillings, assisting in the darkroom with x-ray negs, cleaning and polishing the instruments, observing his dad’s delicate touch and winning personality (every patient’s favorite bartender/shrink/pal). No wonder that later on Chris, after obtaining his BS in Biology at Macalester College in St. Paul, went on to U of Illinois for dental school – just like his dad had done decades earlier. All these years Chris and his siblings were honing a keen interest in water sports, thanks to many years of competitive swimming (Chris was a High School and College All American in 1978,1979 and 1980) and summers spent in the big wind and waves of the Lake Michigan. After graduating from dental school in 1988, Chris associated with his father in Moline before setting his horizons on California, where he and his wife, Annie, re-settled in the small town of Forestville, up north of San Francisco. There he associated with Dr. E. J. LeDu before becoming the sole owner of the practice when his mentor retired. 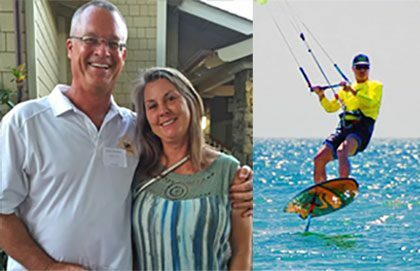 It was in California, that he and Annie developed their insatiable passion for surfing and windsurfing, honing their skills in the frigid, windswept wastes of the Pacific – sharks and seals sometimes their only companions. After a successful tenure of 15 years in Forestville, and having established a thriving dental practice and rewarding life within the community, the bug for adventure and new challenges once again bit him. What if he lived in a place where he could work hard, and play hard year round – warm water, tropical breezes? In 2005, they – along with their sons, Dylan and Evan – pulled up stakes and sailed further west, to Maui; a place they had been vacationing for years. 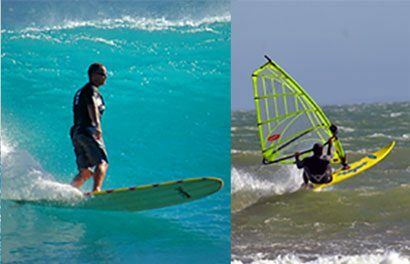 Settling in Paia on the island’s North Shore, the family has managed to find that proper balance of (hard) work, and (harder) play – continuing their pursuit of all types of oceanic water sports: surfing, kiting, foiling, hiking, diving. He’s obviously making good use of his time outside the office. Dr Chris is a dentist versed in (and equipped for) the most modern techniques, but grounded in timeless, old school values – learned from an artisan (his father) who knew how to take great care of people’s teeth (and people). Plus, he’s a nice guy who can spin some ripping yarns about his salt water adventures. Just ask him.